growth. In Alpha Lipid™ Colostrum, the ganglioside is GD3. GD3 is the predominant ganglioside in human colostrum. Gangliosides are particularly important in human brain development up to the age of five. Recent studies suggest gangliosides could be involved in the activation of T-cells which play a key role in the bodyís first line of defence against pathogen invasion. Phospholipids help in increasing brain function, and have been associated with improved memory. They have also been shown to elevate moods and reduce the symptoms of depression. Alpha Lipid™ also helps confer additional dispersability and protection of the IgG (immunoglobulin) molecule. 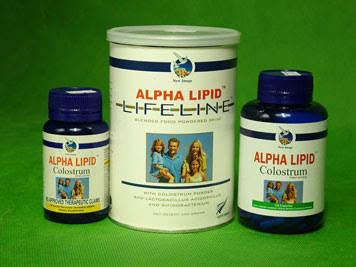 Alpha Lipid™ is an effective protector and carrier of all the vital (and fragile) nutrients in colostrum. It significantly increases bioavailability to the body during the journey through the digestive tract and assimilation through the mucous lining. Alpha Lipid™ appears to greatly enhance the effectiveness of basic colostrum.